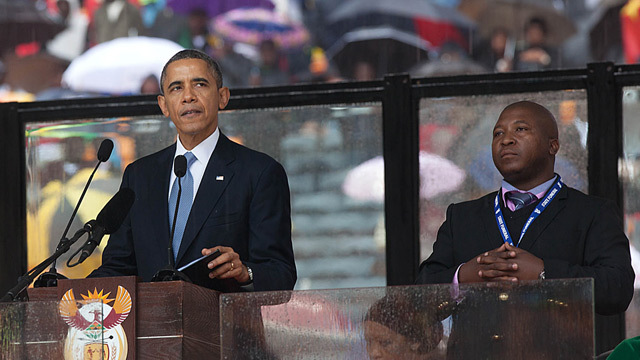 At the public memorial service for the late Nelson Mandela, a man, that was thought to be a sign language interpreter for the deaf, stood on stage beside the President of the United States, and other world leaders. The man gesticulated to the world what was thought to be a translation for the deaf in attendance, and at home watching on TV of each leaders words. There was a problem, though. The "sign language" the man performed on that stage, only feet from our President, and other world leaders, was a fake. He was an impostor. Not a sign language bone in any of those acrobatic fingers, yet he was not removed. He was allowed to stand there for the entire memorial service, and continue to pretend to know what he was doing. No one stood up, and removed him. He fooled everyone that should have known better. Those that were watching knew he was a fraud. The man blames schizophrenia for placing him in the position of an interpreter for the deaf, and fear for keeping him on stage, and maintaining the charade. Schizophrenia is a disease, and the man admitted to taking medication for it. He may have missed a dose, or two, but if what the man said is true, then he has an out. Horrible way to display an illness, but one can now almost understand why it occurred. This does not let those off the hook that should have had this man, and his credentials vetted. Some folks that have not been diagnosed with a mental illness can also take on a whole different persona when placed in the public eye. They can become the life of the party, or just the opposite. All it takes is the right response of an audience, and that will lead to what, and how things are said. Things can go either way, and take on a life of their own. It can go well, or horribly wrong, and like the man in South Africa, fear may prevent them from stepping down from their stage no matter how it goes. Amazing how it went on for so long, and nobody ushered him off the stage even though they knew he was not what he was purported to be. How often do we all look but not see - hear but not listen? Is it a sign of the times? Do we get so much information that nothing seems important? Have our senses been dulled? Things that have been right before our eyes will one day take us by surprise. Why do we just tune out? What will have to happen before we rip off our blindfolds and take out the ear buds? Will it be in time? What Do The People Really think?